Sagittarius constellation lies in the southern sky. It is one of the constellations of the zodiac. It represents the archer. Sagittarius is usually depicted as a centaur holding a bow and arrow. The constellation’s symbol is ♐. It is also associated with Crotus, the satyr who kept company of the Muses on Mount Helicon. Sagittarius is one of the largest southern constellations. It is easy to find because it lies on the Milky Way and its brightest stars form an asterism known as the Teapot. Like other zodiac constellations, Sagittarius was first catalogued by the Greek astronomer Ptolemy in the 2nd century. The constellation contains the Arches Cluster, the Quintuplet Cluster with the luminous Pistol Star, the Galactic centre, the radio source Sagittarius A, and a number of very famous deep sky objects, including the Sagittarius Dwarf Elliptical Galaxy, the Sagittarius Dwarf Irregular Galaxy, Barnard’s Galaxy, the Bubble Nebula, and as many as 15 Messier objects, among them the Sagittarius Star Cloud (Messier 24), the Omega Nebula (Messier 17), Messier 18, the Lagoon Nebula (Messier 8), and the Trifid Nebula (Messier 20). In Greek mythology, Sagittarius represents a centaur, a half human, half horse creature with the torso of a man and the body and four legs of a horse. 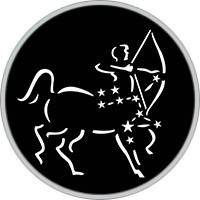 The centaur is depicted as aiming an arrow toward the heart of the neighbouring constellation Scorpio, represented by the red supergiant star Antares. 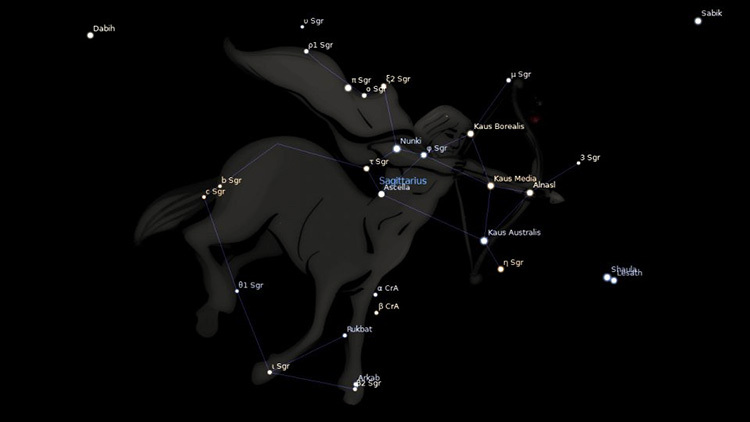 Sometimes Sagittarius is wrongly identified as the centaur Chiron, represented by the constellation Centaurus. Sagittarius constellation has its roots in Sumerian mythology. Eratosthenes associated it with Crotus, a mythical creature with two feet and a satyr’s tail, who was the nurse to the nine Muses, daughters of Zeus. Eratosthenes argued that the constellation really represented a satyr and not a centaur. According to the Roman author Hyginus, Crotus was the son of Pan and the archer the constellation was named after. Crotus invented archery and lived on Mount Helicon. Because he was close to the Muses, they were the ones who asked Zeus to place him in the sky. In Babylonian mythology, Sagittarius is associated with the centaur-like god Nergal, and depicted with two heads – one human and one panther – and also wings, and the stinger of a scorpion positioned above a horse’s tail. How to find the constellation Sagittarius in the sky?